Replacing your roof is a big investment for your home. But not replacing the roof when it needs it can cause even more damage to your home, including water damage to the ceiling and walls, mold throughout the home, and electrical failure of fixtures. It is important that you get regular roof inspections in Peoria so that you know when it is time to get a new roof and don’t leave your home vulnerable to damage. A sagging roof is a sure sign that you need a new roof installation. A sagging roof is caused by rotting materials in the subdecking, such as the plywood or the underlayment. When the materials holding up your roof rot through, the whole thing will eventually fall in. Even if there is not visible hole in your roof yet, the rotting materials can still be allowing moisture and other elements in, which can be damaging your home and running your energy bills sky high. If you see dips in your roof or whole sections that appear to be sagging, call a roofing contractor in Peoria as soon as you can. Tile roofing is popular in Peoria, Arizona because it looks beautiful and it provides superior protection against the heat and the elements. Over time, the tile can become cracked if it is hit by hail or falling limbs, or tile can fall off the roof from degradation of the materials or because they are blown off during a monsoon. Cracked or missing tiles can let in the rain, bugs, and other elements, damaging your home and causing other problems. A few missing or cracked tiles may be able to be replaced, but several are a sign of a problem and may indicate the need for re-roofing. The valleys of your roof are the areas where two sections of roof meet. They typically form an angle, and the rain water flows into these channels and down to the gutters. The valleys serve an important role in funneling water off your roof and keeping it healthy. If the valleys of your roof are damaged, water will start coming into your home more quickly. Sometimes, the valleys can be repaired, but often, they are just the first sign that the roof needs to be replaced. Valley damage is a sign that it’s time to start thinking about a new roof. When your roof starts to fail, you aren’t going to notice the signs on your ceiling first. Water has to pass through the attic and several layers of materials before it ever reaches the sheetrock that makes up your ceiling. Your roof could be leaking for quite a while before you ever notice water stains on your ceiling. Make sure you are inspecting your attic periodically. 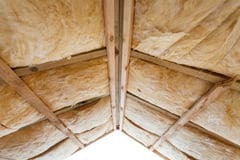 Get up there with a flashlight and check the underside of the roof, the insulation, the beams, and other materials. Look for signs of water damage, and check to see if the sun is shining through the roof at any part. If you see these signs, call a Peoria roofing contractor for a more thorough inspection. Shingle roofs are not as common in Arizona, but they are still found here. If you have a shingle roof, moss and other greenery appearing on it is a sign that you likely have trapped moisture in the attic. The ventilation may not be appropriate for the space, or the roof may be failing and letting too much water into the attic. The only way to know for sure is to call a roofing contractor. You may just have an issue with too much shade near that part of the roof, or you may need re-roofing. Even the best maintained roofs don’t last forever. If your roof is nearing its expected life span, it’s time to talk to a contractor about the options for a new roof installation. A shingle roof typically lasts around 25 years, and a tile roof typically lasts about 50 years. There will be some variety based on the exact materials used, the skill of the contractor who installed the roof, and how well you have maintained the roof. Start talking to a contractor when your roof is near the end of its life, whether you notice signs of damage or not. If you notice any of these signs, don’t put off taking action. The longer you wait to talk to a roofing contractor, the more damage your home may suffer and the more money you may have to spend to repair it. Learn about your options while roof replacement is your only cost. 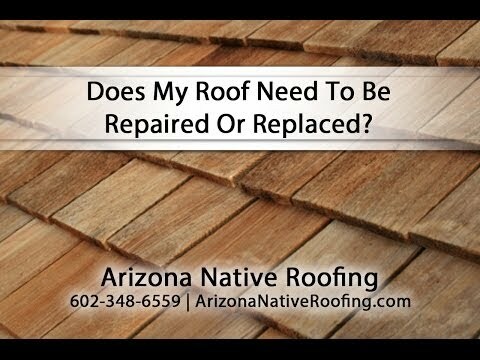 Arizona Native Roofing is a top-rated roofing company performing all types of roof replacements. Our roofing contractors are highly skilled at installing tile and shingle roofing, as well as other types of roofs. Call us today to get a thorough roof inspection and find out if it’s time for a new roof. We’ll talk you through the options for re-roofing to suit your budget and the needs of your property.